Baby Step #1 was all about being ready for a one-week emergency at home. Most emergencies are short-term, and getting ready for just one week is being more prepared than most of your neighbors. If all emergencies occurred while we were safe and snug in our cozy homes, then we would always be prepared. It’s just as likely, though, that an emergency or crisis will occur when we’re out running errands, at work, or traveling. It’s important to have your vehicle ready for those times. Here are some tips for being ready when you’re out and about. 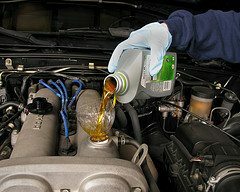 Keep your vehicle ready with regular maintenance. Maintaining our Tahoe is one of my least favorite tasks, but regular oil changes and tune-ups have paid off. I’ve been driving it for seven years now, and it’s humming along like a gigantic white whale. If vehicle maintenance is taxing your budget, try to set aside $20-30 each month specifically for those expenditures. Always have enough fuel. “A tank half full is an empty tank.” A friend of mine learned this axiom in a CERT class. You’ll visit the gas station more often but the expense with each fill-up will be less painful. Store a bit of fuel. Storing gasoline sounds scary, but it doesn’t have to be. I think the most practical tip I’ve heard for gas storage is to purchase gas cans and number each one with a Sharpie, #1, #2, #3 and so on. Fill can #1 and #2 with gasoline and store in a safe place, lined up in numerical order. On the first day of each month, empty the can at the front of the line into your vehicle, refill it and place it at the back of the line. Each month, on the first of the month, use the front gasoline can, refill it, and place it at the back of the line. You’ll always have several gallons stored, and it will be continually rotated. Keep your spare tire filled, have the necessary tools for changing a tire, and know how to do it! By yourself! Store blankets and long sleeved shirts beneath the back seat or in the trunk. In the winter these will keep you warm, and during the summer, the blankets can provide shade and the shirts will protect you from the sun. Equip your vehicle with a 72 Hour Kit. See specific directions here. If you have kids, tuck a few books and a deck of cards somewhere. Choose a read-aloud or two that will appeal to even the younger members of your family and yet be long enough if you’re ever stranded somewhere for a lengthy period of time. Books on CD are another good choice. Hide some cash, $50-100 or so, somewhere in your vehicle. If you’re stranded and need gas, food, a hotel, or some other necessity, you’ll have cash. During a power outage, ATM machines won’t be working, so this precaution is extra smart. Just remember where you’ve hidden your cash when it comes time to sell your car! Have a good road map. If there’s a chance you might be traveling in another state, have that map as well. Keep a good pair of closed toed shoes in your vehicle. If you have my luck, you’ll be stranded on the side of the road, miles from the nearest town and will have to hoof it in your cute blinged-out flip-flops! An old pair of walking shoes will save you blistered feet and having to apologize to the kids later for your use of colorful vocabulary! If your daughter tends to wear impractical, but darling!, shoes, do her a favor and pack a pair for her as well. Personally, I like the type of emergencies that happen when we’re all at home with plenty of everything, running water, and all the electricity we could ever want. But hey! That’s not much of an emergency! There’s a 50/50 chance you won’t be at home when an emergency happens, so get your vehicle ready for anything, and you’ll feel a little more secure. © 2010, thesurvivalmom. All rights reserved.